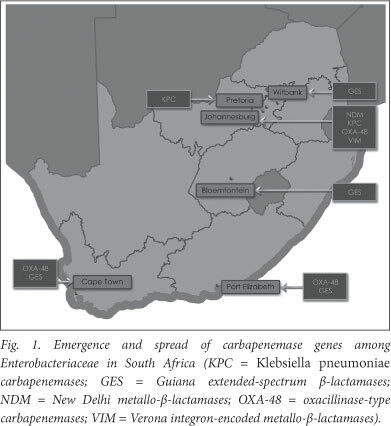 In 2008, we stated that 'the die was cast' regarding the emergence and nationwide spread of extensively resistant (XDR) and pan-drug-resistant (PDR) Gram-negative fermentative bacteria such as Escherichia coli and Klebsiella pneumoniae.1 This prediction was based on the fact that suboptimal antibiotic management as a whole (excessive duration, use of multiple often inappropriate or unnecessary agents, and a virtual absence of de-escalation) was rife in clinical practice in most institutions, and that prescribers ignored antibiotic 'stewardship' as a means of combating the emergence of XDR and PDR Gram-negative bacilli (GNB).  oxacillinase-type carbapenemases such as OXA-48 and its derivates, which also occur in Enterobacteriaceae (class D). Exposure to antibiotics is a prominent risk factor for CRE. Specific antibiotics and specific antibiotic classes have frequently been implicated as risk factors for colonisation or infection with CRE, and these include all the carbapenems, cephalosporins, fluoroquinolones, aminoglycosides and β-lactam/β-lactamase inhibitors.3 Studies have also shown that prior carbapenem therapy is not a prerequisite for carbapenem resistance among E. coli or K. pneumoniae.3,4 The plasmids that confer such resistance frequently carry additional resistance determinants that confer cross-resistance to most other antibiotic classes. Consequently, prior use of any antibiotic may select for a carbapenemase-producing GNB. Rapid routine molecular detection of CRE is essential to optimise therapy and improve outcomes, and to limit the spread of such resistance through aggressive infection control, including the screening of high-risk patients and the facilitation of 'search and contain' tactics.4 Detection of carriers of CRE is currently by far the most important factor preventing further dissemination in hospital settings. CRE have been identified from device-associated infections, particularly catheter-associated urinary tract infections. Limiting the use of invasive devices and using defined strategies that prevent their contamination and infection might be another important intervention to prevent occurrence and spread of CRE.3 These strategies should be urgently implemented in all our hospitals. Urinary catheters should only be used in those patients who have appropriate indications, should be removed as soon as possible, and should have sterile, closed drainage systems. Aseptic insertion and maintenance of all catheters, according to protocols laid out in catheter 'bundles', are essential and constitute best care. The Best Care ... Always! (BCA) campaign was initiated in 2009 to support southern African healthcare organisations in implementing specific, internationally recognised, evidence-based interventions that enhance patient safety and constitute current best practice in hospital care.15 Early BCA results are encouraging and significant strides have been made since some of these bundles have been implemented in over 200 South African hospitals. For example, in 40 and 42 acute-care hospitals of two private hospital groups, a significant decrease in central line infections from 5.24 and 5.78 per 1 000 catheter days to 1.34 (p<0.0001) and 1.27 (p<0.0001) line days, respectively, was recently confirmed over an 18-month period (unpublished, A J Brink, February 2012). Conflict of interests declaration. No external funding was received for the molecular work at the Ampath Molecular Laboratory. AB has received recent research funding from Merck and Sanofi-Aventis, and has served on the advisory board of MSD, Aspen and Pfizer and on speakers' bureau for GlaxoSmithKline (GSK), Merck, Pfizer and Sanofi-Aventis. JvG received honoraria for lectures or assistance for congress travel from the following companies in relation to antibiotics they manufacture or market: Astra-Zeneca, Pfizer, MSD and Aspen. GAR has served on the speaker's bureau of and/or received funding for congress travel from Sanofi-Aventis, Pfizer, Merck and Co. and Bristol-Myers Squibb, Astra-Zeneca, Roche, Winthrop, Aspen, Bayer, GSK, Janssen, Fresenius Kabi and Abbott. CF has acted on the advisory board or received honoraria for lectures or assistance for congress travel from the following companies in relation to antibiotics they manufacture or market: Abbott, Merck, Aspen-GSK, Pfizer, Cipla, Astra-Zeneca and Sanofi-Aventis. Other authors: no disclosure.